I am taking a break over Easter and will be back shortly. Thank you so much for reading; as any blogger will tell you, the payment is in the comments, emails and other feedback you give me and I appreciate every time you drop me a line. Keep your eyes out around Footscray and West Footscray (and the city!) 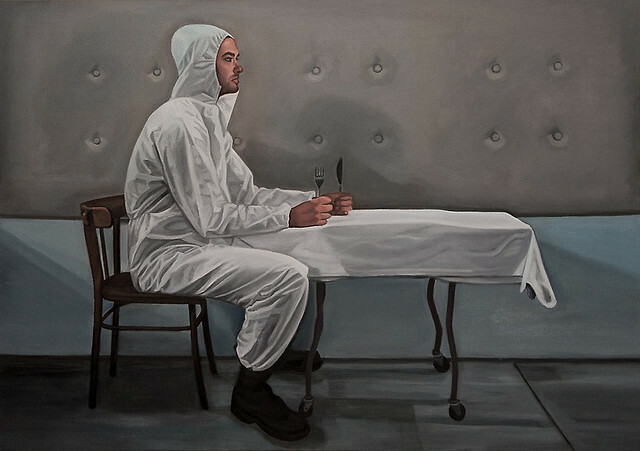 for beautifully haunting street art by local artist Caroline Ierodiaconou, whose piece is featured above. I love her work - it adds another dimension to the suburb I love, beyond the $2 shops and the hairdressers. My last count is five - can you find them? In other arts news, local artist Rayna Fahey has just started a three-month residency at the EcoLiving Centre in Wyndham Vale. Rayna's work involves "traditional" embroidery with a subversive spin or larger-scale outdoor installations. 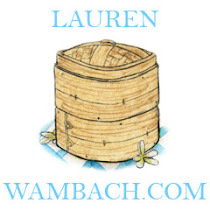 She will be running workshops and other goodies so keep track via her blog to get involved. The official From Cup to Crop campaign ended on April 14 but Plan International's work with vulnerable communities is far from done. My own personal challenge for the month has been to donate $3 for every meal I have out. 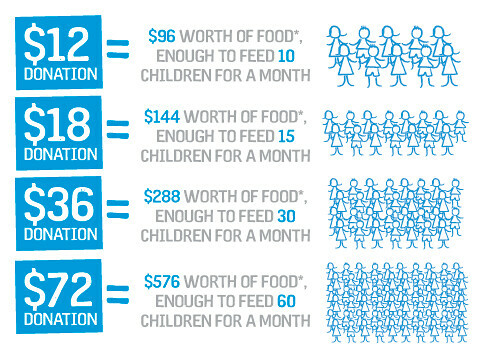 $3 can feed one child for a staggering 10 days with Plan International's partnerships with various humanitarian agencies - the agencies source the food while Plan is responsible for storing and distributing that food to communities they work with in countries such as Southern Sudan, Ethiopian and Zimbabwe. Lastly, I had wanted to do a hot cross bun roundup but tummy says yes, jeans say no! The cakey beauties above are from the Pie and Pastry House at 166 Churchill Ave, Braybrook. 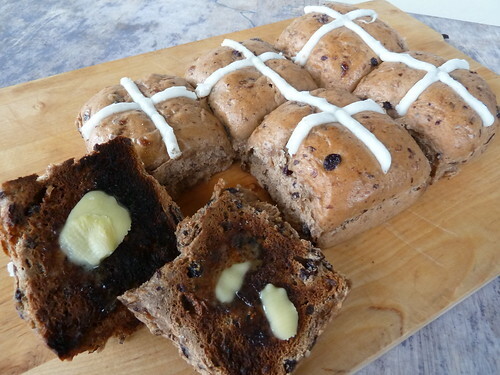 Also try Sourdough Kitchen (sourdough hot cross buns!) 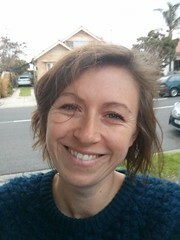 at 172 Victoria St, Seddon and Hausfrau, 32a Ballarat St, Yarraville. If you want a Easter egg tip, Cheaper Buy Miles in Nicholson Street Mall have bargain gourmet eggs, especially getting this close to Easter. Have a very happy Melbourne Easter and see you soon. We want to go on a road trip, but where to go? For someone who really just wants to go on holiday to eat, touring Cunnamulla or Humpty Doo for the best plastic cheese sandwich is really not my idea of fun. Maybe we will go to Cabramatta and do a pilgrimage through all the favourite haunts of Thang Ngo of Noodlies, gentle soul and a-phở-ciado extraordinaire. 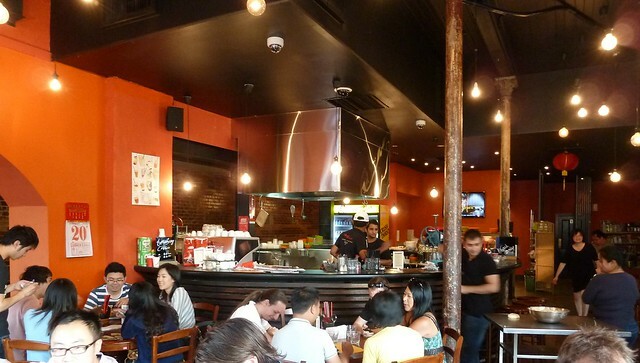 I am so envious of Sydney's vibrant Thai food scene in particular - we really have nothing like it in Melbourne. 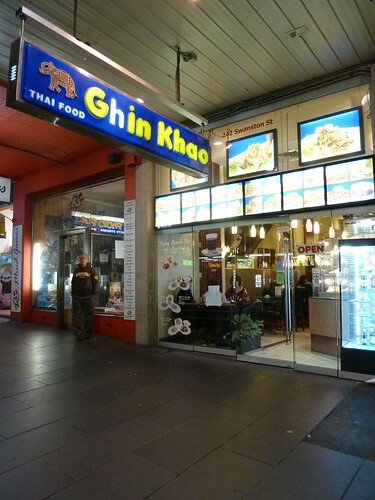 Ghin Khao came highly recommended for authentic Thai food. 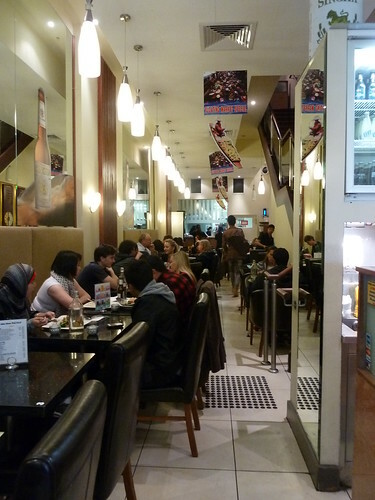 It's in the Swanston Street strip jammed with cheap, student-y and somewhat tasty food joints. I have had more noodle soups at Yoyogi and Gigi over the years than I care to remember. Does that older guy with the shock of fluoro orange hair still work at Yoyogi? Now, we had gone from being unable to get a booking at Hu Tong to Ghin Khao so it was already on the back foot. For some reason I pictured a very different place than this quick snacky student bar. No music was a bit of a downer. It definitely has a real Thai presence though, from the handwritten note in Thai in the window to the gorgeous automatic prayer-like gesture of thanks the waitress did when she took our beer order. There's a room upstairs but it's a bit lacking in ambiance. These were good - very soft, delicate pastry but still with good crispy bite filled with a sweet vegetable filling. 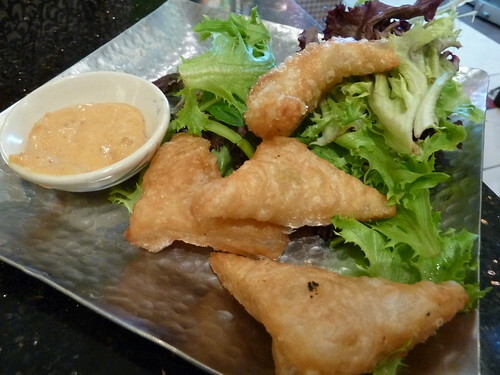 Swiped through creamy peanut sauce and gobbled up with a swig of Chang's beer - yum. I love Thai basil and chilli dishes - like the Vietnamese use of turmeric and dill, I found this at first such an odd combination for an Asian dish. It is fantastic, though. 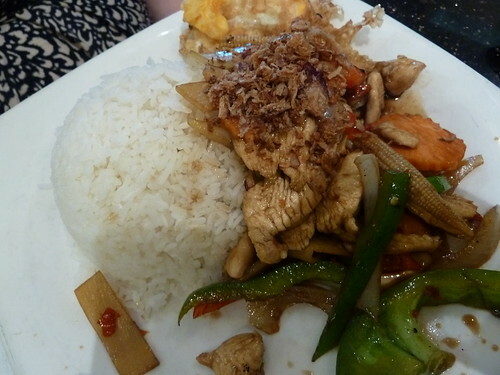 This was nice with very tender chicken but nothing on, say, Thaila Thai's. 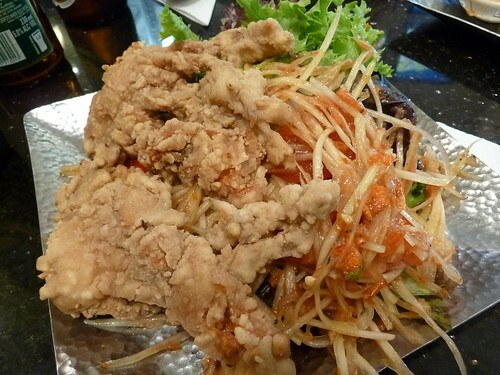 Soft shell crab is a crab that has recently shed its harder exoskeleton and only has a very thin skin that is edible. Now that I have totally turned you off your breakfast, trust me, I am an offal wuss and I looove these. This was good but the batter was quite heavy. I much prefer the very light, salt & pepper-style batter in Vietnamese restaurants, maybe so I can kid myself I'm not eating something deep-fried. 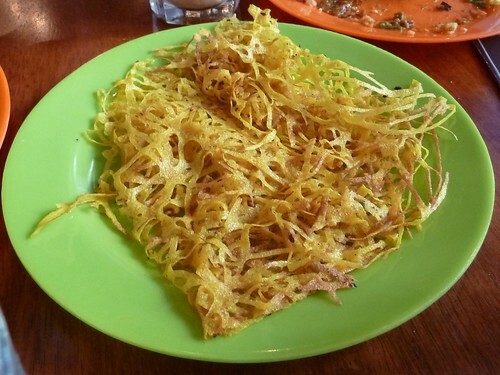 The green papaya had been prepared ahead, shredded and soaked for a while in a sweet, vinegary, hot chilli dressing. The other component of the salad was undressed standard baby lettuce mix. It was good but not great. Winter is on its way. Juicy steaks on the grill give way to luscious braised chunks of chuck steak. There's nothing more pleasurable on a cold day than coming home to a house filled with the scent of chilli or pot roast emanating from the trusty slow cooker. Roasted pumpkin is such a pleasure too, the taste of autumn itself - rich, sweet and slightly musty, like piles of autumn leaves. 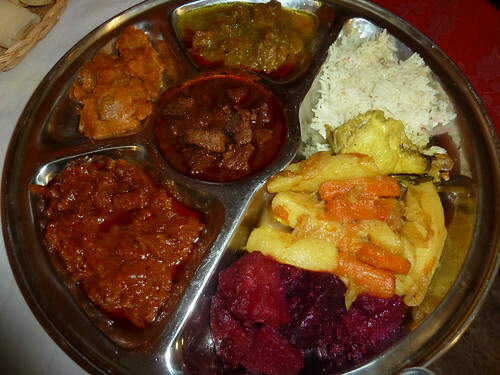 Ethiopian food is brilliant for cold weather in my opinion. 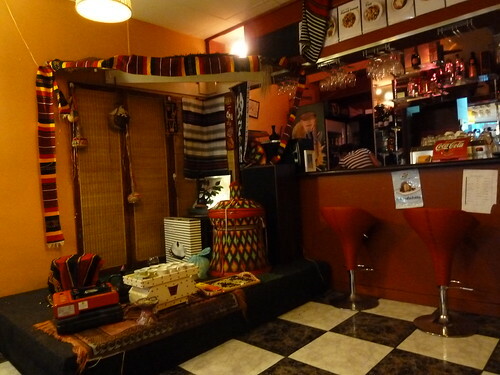 I'm yet to find a "bad" Ethiopian restaurant in Footscray - they all have their charms. Dinknesh Lucy, next to Lentil as Anything on Barkly Street, is named after one of the earliest hominids ever found, unearthed in modern-day Ethiopia. Here's the little dais dedicated to the coffee ceremony which you can book ahead. The green beans are pan-roasted before being ground, brewed and served. You can see/buy the green beans at Blue Peak Coffee and Nuts, next to Coles in Footscray Plaza. My understanding of Ethiopian food is rudimentary at best but it can be vaguely divided into wet stews (wot are spicy, alicha are mild) and tibs dishes which are drier, like stir-fries. B and I couldn't decide between the yebeg tibes and the zil zil tibes. We asked the lady and she immediately said, "Yebeg tibes. Zil zil tibes, you might not like." So naturally we wanted the zil zil! I have had yebeg tibes before and it is great - juicy lamb pieces dry-fried in clarified butter with onion and green chilli. Apparently the zil zil is partly dried meat - the pieces were long "steaks" that had been cut to open somewhat like paper dolls in a long zigzag. The flavour was fantastic, rich, aged, complemented by the tang of the onions and green chilli and with a fabulous charred flavour. The meat was so tender too yet hardened as it cooled, which is not a criticism - evidently the heat must "wake up" the fibres somehow and it kind of re-dries as it cools down again. Really fantastic - definitely one to order again. 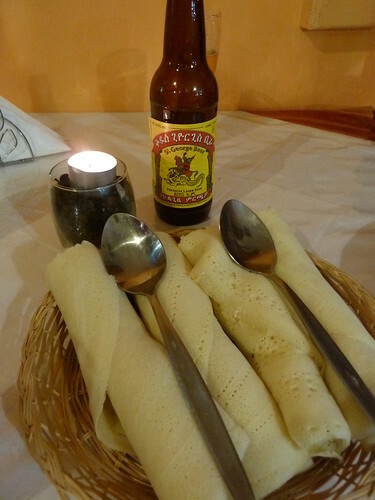 The chef's combination is always a safe bet in any Ethiopian restaurant. This didn't follow the exact dishes on the menu, which I didn't mind in the slightest. Starting from the bottom left-hand corner is "sugo" which is a meat stew not on the menu - rich and tomatoey. Going clockwise, bozena shiro, chickpea flour with beef pieces and berbere (tasty but quite salty), alicha wat, lamb pieces in a mild sauce with garlic and ginger (divine!) and in the middle, key wot, lamb pieces again with ginger, garlic and the addition of paprika-rich red berbere spice. On the right lay magenta beetroot and potato and turmeric-yellow potatoes, carrots and cabbage. All very individual, totally yummy, rich but not overpoweringly so. Injera, Ethiopia's national bread, made by fermenting flour and then cooking on one side like a pancake - see Kenny's recent visit to Footscray's Lemat Bakery to see how. Just tear off pieces and pinch up the meat or vegies, like pita bread. My kids love it and I am happy to let them eat nothing but bread and save all the rest for myself! Eventually they get curious and ask to taste a bit of yours. This goes for rice at Asian restaurants or roti at Indian restaurants - it doesn't matter if they won't eat the whole spread, just start them off with the basics and you can build on it. Or not and leave it all to yourself, heh heh. 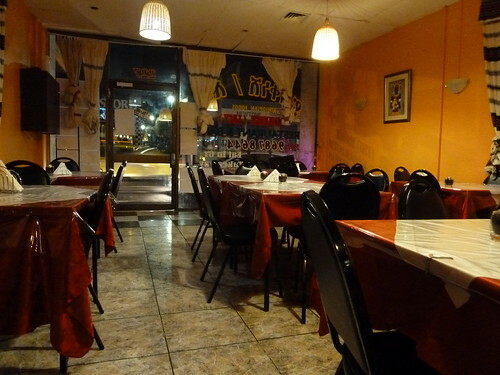 Love this place - we did not need both dishes; one would have sufficed and fed both of us for $12 or $15. That night we were served by three gorgeous women who had such snappy panache. Don't let the empty chairs fool you, it was relatively busy when we arrived. Dinknesh Lucy do live traditional music about once a month - give them a call to find out when the next night is on. Worth the walk, even on a wintery night. 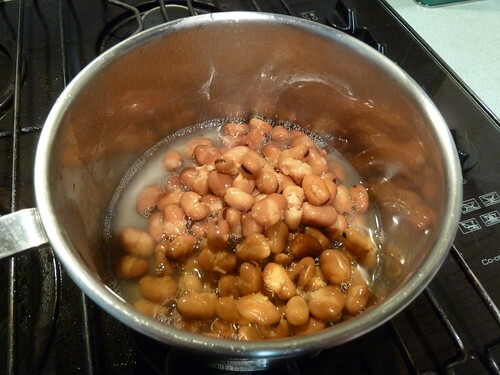 Ful or dried broad beans are served many different ways across the Arab world, from the more Levantine whole version to thick, rich mashes in Egypt and Sudan, often mixed with red lentils aka masoor dal (masoor from Misr, Arabic for Egypt, hence "Egyptian lentils"). This is a recipe from my friend S who is a Kurd from Syria. It is a gorgeous, fast, healthy, vegetarian breakfast. 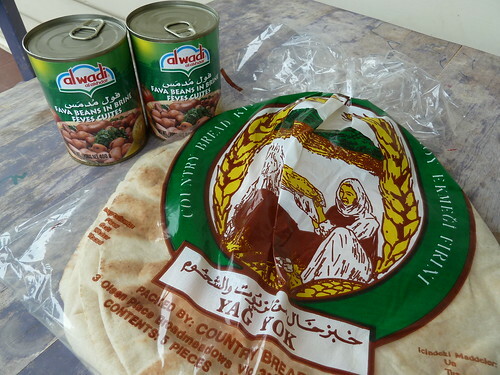 Buy canned ful from any Middle Eastern-style grocer - these were from Big Trade, the supermarket in Footscray Market, but also try John's Nuts in Paisley Street. Tip out the liquid quickly but don't drain them fully (fully, LOL), rather, fill the can back up with water so you have about half juice, half water. Tip into a pot and heat slowly. Meanwhile, make the sauce by mixing yoghurt, tahini and lemon, beating well to get rid of lumps and seasoning with a little salt. Incidentally if you add crushed garlic to this, you have the best-ever sauce for felafel wraps. Put hot beans in bowl, top with sauce, sprinkle with tomato, parsley and garlic and drizzle olive oil all over. Eat with pita bread (buy it fresh daily from Masters Fruit & Vegie in Footscray Market or the halal butcher on the corner of Irving and Nicholson). We had actually eaten all the pita bread the night before - really fresh pita is so delicate and seductive, and really needs no sauce at all - so we made do with this fabulous ciabatta from Blu Cow Deli (made even more fabulous by costing $2.95). 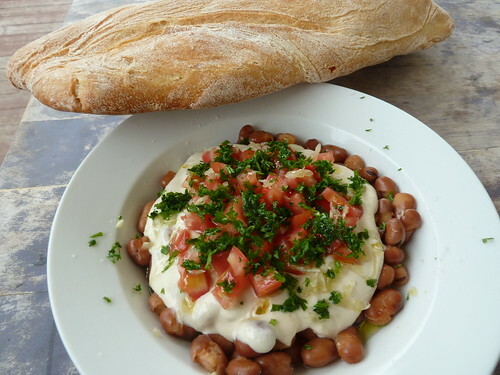 Eating the ful with ciabatta reminded me of once in New York eating a very similar breakfast dish made with marinated chickpeas. I was at the home of a beautiful Lebanese family and early that cold winter morning, the father went out and returned with a huge bag of bagels. Eating traditional Jewish bread with an Arab salad, pinching up tangy, garlicky chickpeas with a poppyseed bagel, was just a small expression of a desire for sectarian harmony and a memory that has stayed with me ever since. Well before Britain colonized both countries, India and Malaysia had had historical connections throughout the centuries through trade. Even before the 13th century (!) Indian ruling dynasties had established trading posts and even provinces in modern-day Malaysia. During colonization, however, the connection became more explicit when the British rulers “imported” thousands of very poor South Indians to became indentured labourers on various projects. Most were from the state of Tamil Nadu and many stayed, intermingling with the local people and leaving their mark on Malaysian cuisine. If you have ever wondered why there is ‘roti’ in an Indian restaurant (round, flat wholemeal bread, somewhat like a tortilla) and ‘roti’ in a Malaysian restaurant (flaky, oily, pastry-like squares), this is why. The Tamil migrant workers set up kopitiams (coffee shops) and hawker stalls, and the food they made was known as ‘mamak’ cuisine. They took the bread of their homeland and (according to Madhur Jaffrey) competed in the spectacle of tossing the bread like pizza to get it as thin as possible. 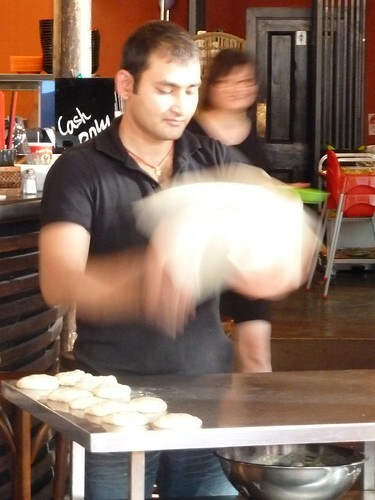 Hence ‘roti canai’, the Malaysian word for this puffy, crispy, pastry-like bread, from Chennai, the original name of Madras, the city in South India from where many of these workers came. 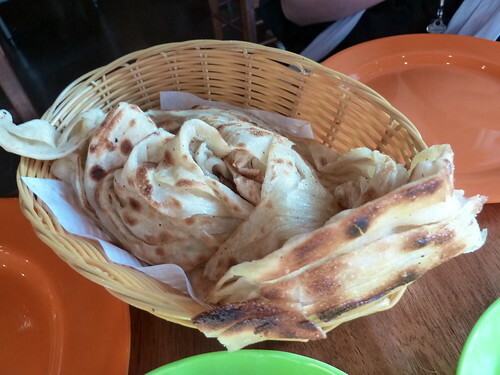 I love Malaysian roti – it was a big part of our family BBQs. My dad would buy the square packets of three or four pieces and grill them on the BBQ or on a flat griddle pan before cutting into squares with scissors. 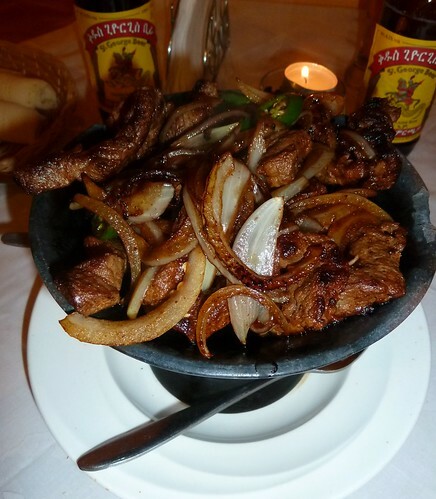 We ate it with sausages or BBQd chicken – totally untraditional but we thought it was great. 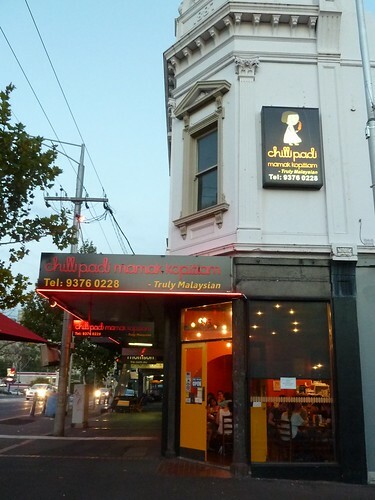 I had been dying to try Chillipadi Kopitiam Mamak, a new restaurant in Flemington which celebrates Mamak or Malaysian/Tamil Muslim-style food, especially after Bryan’s gorgeous ‘happy roti man’ post. 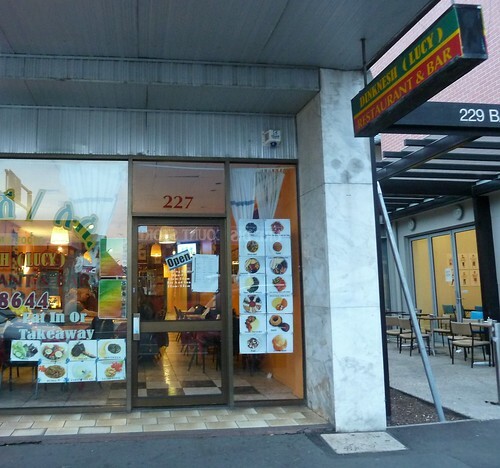 When Penny organized a meetup of some of Melbourne’s food tweeting fraternity for a six-course roti banquet, despite being the crappest tweeter know to humanity, I just had to go. Chillipadi make all the roti right here. Oiled pastry knots are rolled and slapped out, twirled until paper thin. But instead of being folded into little parcels, here they were twirled back into coils before being grilled and presented like roti escargots in little baskets. The textural variation is just gorgeous. There’s the soft, feathery interior then the flaky, crunchy exterior, sloughing off dark, crackly flakes. It is traditional to have roti with a small bowl of curry. 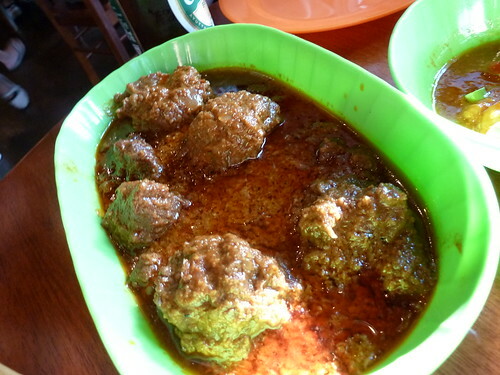 This beef rendang was absolutely off the hook. The chunks of beef were so tender – you could tear them with your fingers, the meat shredding into strands. The sauce was just divine, very oily but that is the idea, that you just have a little to pinch between pieces of warm roti bread. So fantastic! 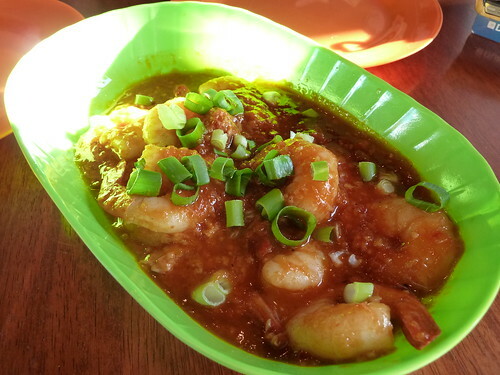 These chilli prawns were similarly gorgeous. The sauce is quite sweet and is thickened with strands of beaten egg, like egg drop soup or stracciatella. The prawns were pretty special, juicy and fat, definitely fresh, not precooked. According to Bryan the sauce here is very similar to the sauce for chilli crab. It was only manners that kept me from licking the plate. Next was roti jala. A thin batter squiggled onto a griddle to create “nets” of pancake-like bread. This came with excellent chicken curry with just the right amount of coconut creaminess and lots of lovely warm spices like cardamom. 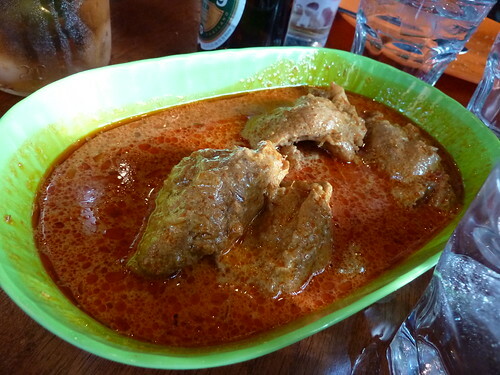 As is apparently traditional, the use of coconut milk is quite light here compared to how Australians might normally think of Malaysian curries. The curries here are seriously good. We ate the roti with the chicken on top like spaghetti. It was fun, but I wanted more of the original roti canai! Roti Ruben, Chillipadi’s own creation. 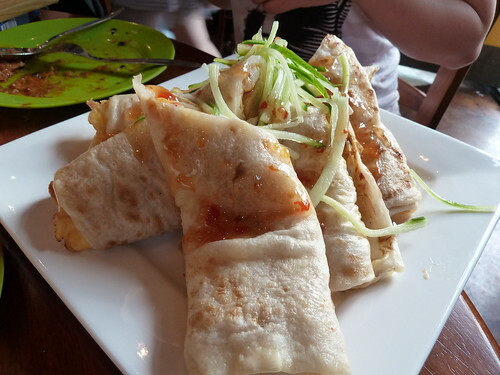 Soft, doughy pieces of square roti filled with chicken, mayonnaise, sweet chilli sauce and an egg omelette. I actually really liked this but others on my table found it too stodgy. It was so sweet, it almost could have been a dessert, but it was tasty and well-made. It you go with a group, get one to split - I think it is a winner! I was so keen to try this. 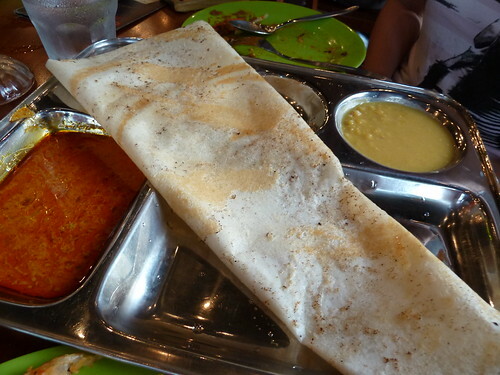 Dosa is a famous South Indian delicacy, a huge, thin crepe made with fermented ground rice and lentils. It is crispy and tangy and is often served stuffed with fillings such as spiced potato, egg, mince or cheese. This had also come to Malaysia via the Tamil migrants, morphing into "thosai". Instead of the traditional sambar or very thin, spicy red dal/soup of the Indian version, it came with dalcha, a thick puree of mildly spiced yellow split peas and a small serve of thin, coconut-based curry sauce. I was so full by this stage I just had a mouthful but it was lovely - looking forward to going back to have another. 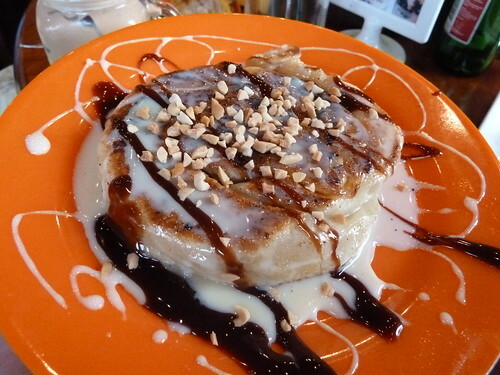 Roti bom, the original roti canai squiggled with condensed milk and chocolate topping. OMG! Pretty intense but good. I was absolutely far too stuffed to do anything but jaw-drop at this. 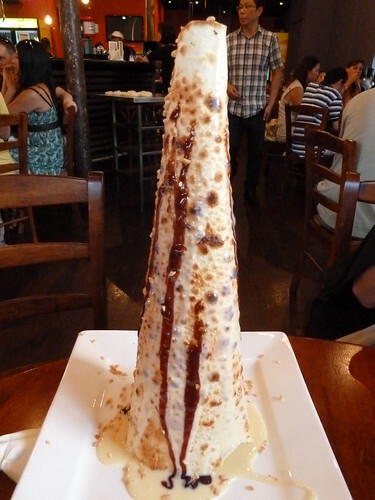 Roti tisu, a Matterhorn of crispy roti bread with slalom trails of condensed milk and chocolate sauce careening down it. 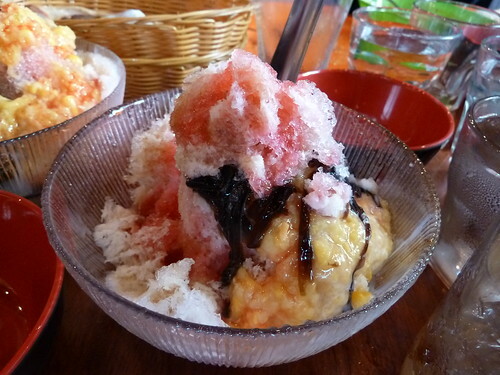 Ice kacang, a traditional dessert of shaved ice and various toppings - there could be condensed milk, palm syrup, corn, candied fruits, jellies etc. I am not an enormous fan of ice kacang in general but it is certainly fun. I think this is the dessert about which on Food Safari Maeve O'Meara said, "That's a party in a glass!" Chillipadi have a really great drinks menu. 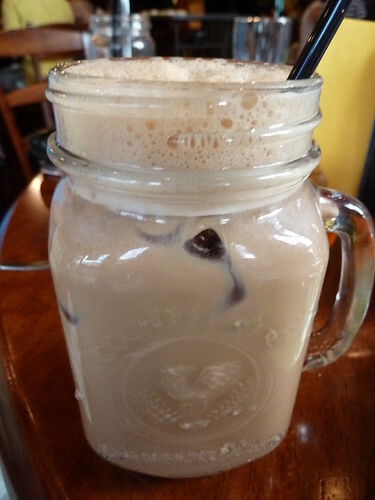 This is the longan drink, served in a Fowlers Vacola jar (#20 for preserving nerds out there). It was really delicious, sweet but not cloying, long and refreshing. Bryan did laugh at me because I couldn't eat the longans or round, lychee-like fruits at the bottom. I just cannot get into chunky "things" in drinks. The fact that the Malay word for longan is "cat's eye" only adds to my distaste. Bryan had raved about the teh peng here. 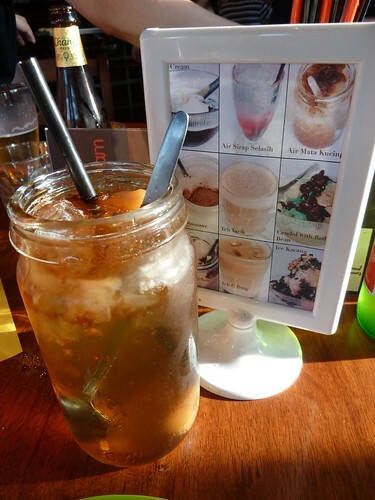 The tea or coffee is a big part of the kopitiam or Malaysian coffee shop experience. So I went from a cat's eye drink to this teh peng, where one sip and my mouth went like the other end of the cat. It was so astringent and tannic. If my tea overbrews I will tip it out - I like strong tea but not overbrewed. Bryan came and tasted it and said that is the taste he craves, that traditional, powerful astrigency, blended with lots of condensed milk. It's poured multiple times from a great height to create the bubbles on top. So interesting - the childhood taste he was after was diametrically opposed to how I, with an Anglo-Saxon background, think of tea. Good to see that Chillipadi have not toned this down for a Western palate! Now I know everyone loves Laksa King, but go a bit further down the road and try Chillipadi Mamak Kopitiam out - I think they are great. They have a fabulous-sounding mamak nasi kandar, somewhat like a thali with rice, two curry sauces, two meat and one veg for $10.50. Also check out Addictive & Consuming and Let's Get Fat Together who between them I think have pretty much eaten the whole menu! Disclaimer: All attendees paid for their meal - although there was a set menu, this was a meetup, not a PR-style invite dinner.